With 360 and virtual reality filmmaking now readily available (and more importantly affordable) for filmmakers at all levels and debates about the part it will play in the future of entertainment (will it become a mainstream medium or be just another fad set to fade away before you can blink?) ever-present, it was only a matter of time before we here at Directors Notes dipped our toes into this popular interactive format. So when Mackenzie Sheppard, an award-winning director we’d keenly had an eye on, released a 360-music video for French power pop band Pony Pony Run Run on Vimeo (yep, they finally joined the 360 arena), we couldn’t pass up the opportunity to talk to him about the positives and negatives of the format. People who spend far too much time on Vimeo, like myself, will already be aware of your work from your staff picked videos OBA-CHAN, MAN IN PHONE (my personal fav), Yoshi’s Blend and First Light. Can you tell us a bit about your path into filmmaking? I grew up in Japan in the countryside. Aside from doodling with a camera in elementary and middle school, I started taking film-making seriously in high school doing small documentaries and vignettes on people I knew or knew through friends. From there, it grew into something I was doing all the time. After doing 4 years at UBC in Vancouver, while also starting to do commercials in the summer in Tokyo, I moved back to Japan where I have been for the last 4 years. Movies like OBA-CHAN, MAN IN PHONE are all projects that I sandwiched in between commercial gigs. I am always hammering something out behind the scenes to keep the ideas fresh and flowing–making sure I get to explore ideas/themes that I am unable to explore in the commercial world. It’s easy to get sold as a ‘certain’ kind of director in the commercial world. So movies like MAN IN PHONE shake things up, and new commercial gigs start to come in because of the personal work. It’s the only way to keep moving forward. Your latest project sees you exploring 360 video in a fun and energetic promo for Pony Pony Run Run’s Alright. How did you come to be directing the video and where did the concept come from? My rep, Greg Panteix from STINK Paris got in touch with me. He sent me two tracks by the band and basically said it’s an open field for doing something fresh and different. The only parameter was it needed to be shot in Japan–since the band’s last two clips were always travel centered. And I had two concepts kicking around–one of which was centering around an Umbrella. In Japan when it rains, everyone is prepared. Nobody braves the rain with a raincoat. As soon as one drop of rain hits the ground, the umbrellas are drawn out from coats and purses. Everyone is suddenly in their own little personal sphere–cut off from everyone else. Most iconic of these umbrellas is the Clear Plastic ‘conbini’ umbrella–an umbrella that can be purchased quickly at any local store. So these clear umbrellas are everywhere. You never feel bad about leaving them behind or forgetting them at a restaurant, because there are so many of them abandoned throughout the city. So, this idea of an umbrella that goes from owner to owner popped into my head. On top of that. when we’re in our umbrellas we feel isolated but protected from the gaze of other people. It’s our own personal bubble. A mini reality. A sphere. So I thought this would be perfect for a 360 film…an umbrella is 360degrees, it’s spherical, it’s our own private zone…. So I decided to take this paradigm, and turn it on its head. What if a man stumbled upon an umbrella that took him OUT of his comfortable private sphere, and DROPPED him into uncomfortable situations? The idea of making a 360 film where the CAMERA is the actual OBJECT seemed like a really cool idea to me. 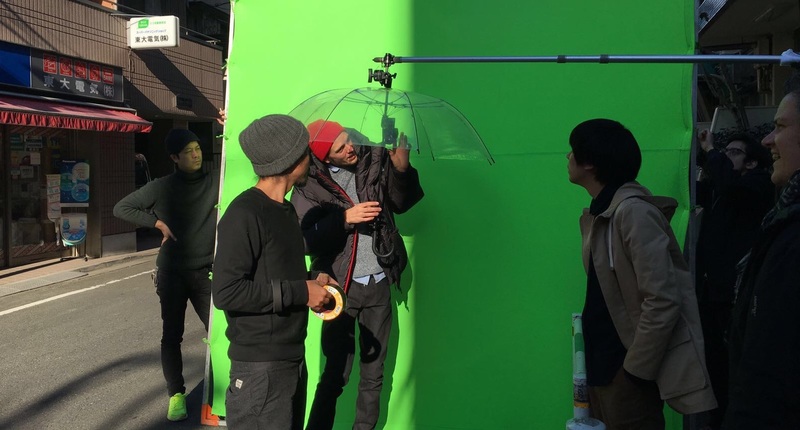 For anyone who knows about shooting 360 video, the use of the umbrella in the story is a real genius idea, where did this come from and for those “floaty” shots did you really just drop a 360 camera on an umbrella off a building? Up until now, everyone hated on 360 films that had a band performing in a circle or dancing girls close to camera. It was a pretty bland use of the medium. So the idea of making a 360 film where the CAMERA is the actual OBJECT seemed like a really cool idea to me. And I’ve always been a fan of personifying inanimate objects and making weird camera rigs so this was up my alley. Since our camera is basically an umbrella, you can do essentially anything with it. For the floating shots at the beginning, we used a 6m boom pole with clear string attached to a simple wardrobe hook taped to the top of the umbrella. We’d then just do a couple takes of us whizzing it off a building until we got one that I liked. For the forest shots, we used a ghetto string cable system, where Oliver (the DP) went up to the top of the forest and held the string high above his head while holding the umbrella rig. I then walked neck high in ferns to the bottom of the forest. We counted down, and then I pulled the string taught, and the umbrella just slid down the rope to the bottom–giving us a nice smooth 30 sec shot. I then reversed this shot in post to make it feel like we were going up the hill. Can you tell us a bit about the production of the video – how long did it take to shoot, what camera did you use, size of crew, etc.? We shot over two days in various locations across Tokyo. I scouted them all myself beforehand, with help from Satoshi Takahashi and Takayuki Moriyan from NION (our original content company) in taking care of all the logistics. Casting was all friends. We tested a bunch of cameras. At first, the higher resolution GoPro x6 Camera rig was my choice, but we realized that if you are closer than 2 feet, the image cannot stitch all the 6 clips properly. So we settled for the Ricoh Theta S camera. It’s only HD, but it was small enough that I could just tape it to the umbrella..and voila camera prep was done. 360 filmmaking comes with a new set of challenges – how did you find the experience and do you have any advice for anyone looking to make a 360 video? 360 is a new medium. There are a lot of possibilities–but you have to ask yourself whether or not you really need to shoot your idea in this way or not. I haven’t made a 360 film since I did this project. I have other ideas I want to shoot–but I feel like the technology needs to catch up. The Ricoh worked for us on the MV, but1920x1080HD on anything bigger than an iPhone looks atrocious. It’s blocky and low res….we made it work for the MV–making it feel like a glitchy experience…but it’s really old sensor technology. I think Ricoh has the best design out there. The 2xFisheye Lens Approach to 360 is the way to go. It’s the only way to get a good stitch, and RICOH has managed to keep their two lenses almost back to back which means you are capturing everything. There’s no dead zone between the lenses. They also have the best software for stitching, and an auto horizon algorithm that saved me on the MV. As soon as they come out with a 4k version of their RICOH Theta, I will be shooting more 360. As for post production, editing 360 video is just like any other edit. You have a rolled out piece of video, and you just splice it normally. At the time, I didn’t have a 360 viewer in Premiere to see how it all looked as I went. I would always have to export it. But now you can do it in Premiere with a plugin–so that is a great advancement. A short film coming to Vimeo within the next little while. STAY TUNED.